Taiwan’s HTC mobile phones are seen on display near Apple Inc.’s iPhones in a popular computer market in Taipei, Taiwan on Wednesday. As Apple Inc.’s iPhone faces stiffer competition in the lucrative market for smart phones, the company is going after one of its main rivals with patent lawsuits claiming theft of touch screen technology and other features. The complaints, which Apple filed Tuesday, cover a slew of models made by Taiwanese phone maker HTC Corp., including the Nexus One, G1 and myTouch 3G – all using the free, rival Android mobile operating software from Google Inc. Non-Android phones include HTC’s Touch series. But consumers shouldn’t worry about buying or using any of those phones. Patent cases can take months or years to resolve – sometimes longer than the life of these phones – and agreements over licensing and royalty payments often emerge. Still, it shows Apple’s get-tough strategy as significant competitors emerge. Apple said HTC has infringed on 20 of its patents covering aspects of the iPhone’s user interface and hardware. Several relate to technology behind touch screens, including one that lets a device’s screen detect more than one finger touch at a time, allowing someone to zoom in or out by spreading their fingers apart or pinching them together, for instance. Another patent refers to using sensors on a device to gather information about a user’s activity or surroundings and letting the device react by, for example, lighting up. Google, whose software powers many of the HTC phones, was not listed as a defendant. When the iPhone first came out in 2007, it changed the smart phone landscape by introducing a stylish, easy-to-use device. Apple later followed with an application store that extended the capabilities of the device far beyond just making phone calls, checking e-mails and surfing the Web. Since the iPhone’s debut, Apple has had a lock on much of the smart phone market, alongside Research In Motion Ltd., which makes the popular BlackBerry devices. However, over the last year or so, more competition has emerged from such phone makers as HTC and Motorola Inc., which are rolling out smart phones that use Google’s Android software. Not only do these phones appeal to consumers, but they also work on numerous wireless networks, unlike the iPhone, which is still limited in the U.S. to AT&T Inc. In a court filing, Apple said HTC’s phones improperly used Apple’s patent—protected technologies without a proper license. Apple is seeking unspecified damages and court orders to block U.S. sales of HTC’s Android phones and other products that Apple says violate its patents. The complaints were filed with the U.S. International Trade Commission, which has the power to block imports of products and parts made with contested technology, and U.S. District Court in Wilmington, Delaware, which can award damages and order HTC to stop sales. In an e-mail message, HTC spokeswoman Linda Mills said the company only learned of the lawsuits on Tuesday through media reports and hasn’t had time to review Apple’s claims. “HTC values patent rights and their enforcement but is also committed to defending its own technology innovations,” Mills said. Technology companies routinely file complaints against competitors over intellectual property. Apple itself faces litigation over the iPhone and other products from the Finnish cell phone maker Nokia Corp., which claims that Apple is using patented technology that helps cut manufacturing costs, shrink the size of consumer gadgets and preserve battery life. Apple responded to Nokia’s complaint by filing a countersuit. Canaccord Adams analyst Peter Misek noted that Apple has not sued that many companies in the past, so the HTC lawsuit must either be a strategic move or the result of what Apple considers a clear infringement on its patents. If Apple prevails, HTC would face a big roadblock, In-Stat analyst Allen Nogee said. Nogee said Apple likely waited for awhile to file the complaints because, with several devices now out, it could see a bigger financial gain in the end. “If they pounce the first day a phone comes out that infringes on a patent then the biggest take they can have is the revenue from that one phone,” he said. Shares of Apple, which is based in Cupertino, California, slipped 14 cents to close Tuesday at $208.85. I’m sorry, Cupertino, but Microsoft has nailed it. Windows Phone 7 feels like an iPhone from the future. The UI has the simplicity and elegance of Apple’s industrial design, while the iPhone’s UI still feels like a colorized Palm Pilot. 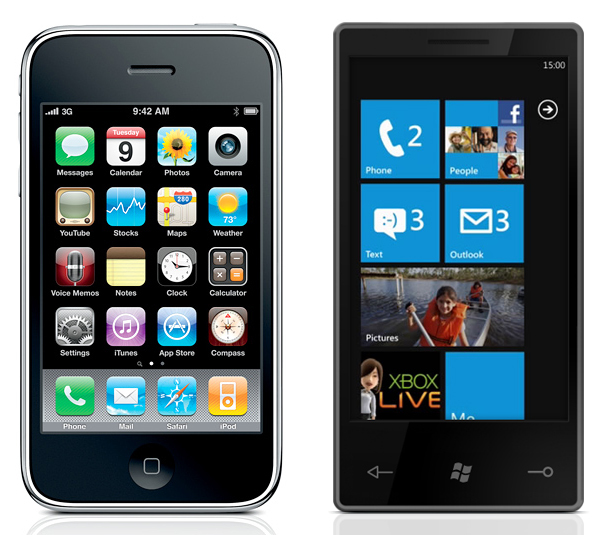 That doesn’t mean that the Windows Phone 7’s user experience would be better than Apple’s. The two user interface concepts—data-centric vs function-centric—are very different, and the former is quite a radical departure from what people are used to. And if you’re not familiar with Windows Phone 7, check out our hands on and the post where we explain everything about it. It’s pretty simple idea, which made it a raging success. In fact, that success is the reason why this model is Apple’s bet not only for mobile phones, but for the future of computing. It is also the reason why the Androids, Palms, and Blackberries of this world are following them. Microsoft’s approach is completely different. Instead of becoming another me-too cellphone, like Android and the rest, the Windows Phone 7 team came up their own vision of what the cellphone should be. In the process, they have created a beautiful user interface in which the data is at the center of user interaction. Not the apps—specific functions—but the information itself. At some points, in fact, it feels like the information is the interface itself. Out of the box, this information is organized into areas called hubs, which follow the user’s areas of interest. 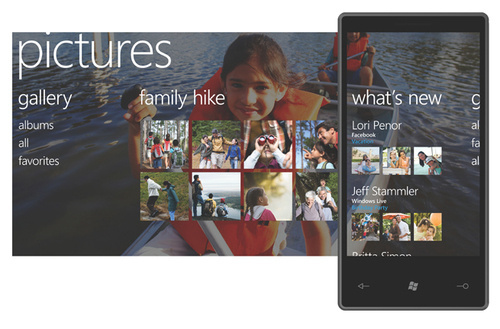 Accessible through live tiles in the home screen, the Me (the user), people, pictures and video, music, and games—plus the omnipresent search—hubs give views into several data sources, connecting and presenting them into an interweaved panoramic stream. These hubs dig heavily into many databases, both locally and into the cloud. 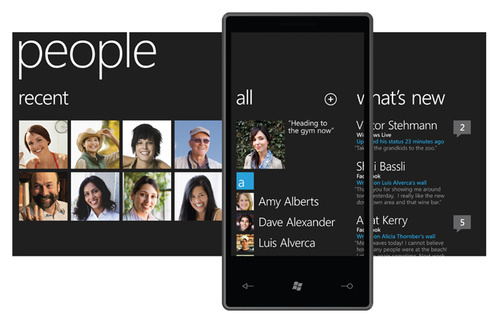 Rather than accessing an app to get contact information and make a call to a person, open another app to get her Twitter updates, and then another app to get her Facebook updates, and another for her latest mails to you, and yet another one to watch her photos, the Windows Phone’s people hub offers a seamless view into all of it, presented in a very simple and logical way. On a function-centric model like the iPhone, when the user thinks “I want to make a call”, he puts the device in “calling mode” by clicking on an app, selects a contact, and calls. When the user thinks “What’s up with John Smith?” he puts the device in Facebook or Twitter or Mail mode, and so on. Microsoft has organized the hubs into panoramas, by stitching groups of information as columns of a single landscape screen—bigger than the phone’s display—that can be scrolled with your finger. The solution—tied together with minimalist interface aesthetics and animations that are inviting, elegant, and never superfluous—works great. Instinctively, I like Microsoft’s approach to organizing the core of our digital lives—people+social+multimedia+communication all merged into the hubs. I like it better than the “it’s a phone, it’s a mail program, it’s a browser, it’s an iPod” Apple approach. It’s less rigid than the iPhone or Android’s model, offering a richer experience, inviting to explore, and offering data from many points of view in a quick, clearly organized way. It also seems morehuman, and that’s certainly something Apple—or their followers—have to worry about. Does that mean that function-centric models are worse? Like I said before, not necessarily. Especially because the information-centric panoramas don’t fit every single task people expect their iPhones to perform now. And when I say every single task, I really mean the two gazillion apps populating the Apple store. Microsoft could dress the hub experience in any way they want, but if their devices don’t offer a rich application market, they will fail the same way the current competition is failing against Apple. Fortunately for Microsoft, the Windows Phone model is not only information-centric, but also function-centric. According to Joe Belfiore, gran jefe of the Microsoft’s Windows Phone Program, applications are not required to plug into the hub metaphor or the panorama user interface. When the development toolkit comes out in a month, it will encourage applications just like the ones you have in the iPhone today. In other words, Microsoft understands that one approach is as important as the other. They are just hoping that their hubs would be a better, funner, more intuitive way to access and cultivate our digital lives, which is mainly what most consumers want to do nowadays. Looking at what they have shown today, I think they may be in the right track. But, like the Zune HD, it just may be too late. 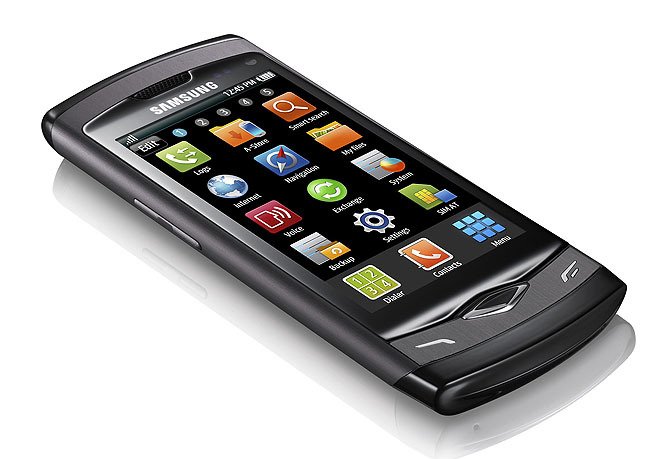 At this week’s Mobile World Congress, South Korean electronics giant Samsung formally unveiled the Samsung Wave, the company’s first phone based on its own Bada smartphone operating system. The Wave features a 3.3-inch AMOLED display, an integrated Social Hub for social networking and communications features, and Samsung’s own TouchWiz 3.0 user interface for a slick look at feel. Plus, under the hood the phone features a lightning fast 1 GHz processor, tons of memory, and multitasking to provide users with a very flexible mobile experience. The Wave is due to start shipping in April…but the question is whether the world is really ready to embrace yet another mobile device platform with Bada. The Wave will feature a snappy 1GHz processor and an 800 by 480-pixel 3.3-inch AMOLED display using the same DNIe (Digital Natural Image engine) technology Samsung uses in its TVs. The phone will also sport Samsung’s TouchWiz 3.0 interface with a fully customizable home page, and a Social Hub that can tie into Facebook, Twitter, and other social networking services. The Wave all also support a variety of video formats (DivX, XviD, MP4, and WMV are all on tap) along with 5.1 surround sound; the Wave will also pack Bluetooth 3.0 connectivity (which Samsung claims will be a world’s first) along with 802.11n Wi-Fi. Users will be able to download apps from yet another app store (Samsung Apps). The Wave will also sport a 5 megapixel camera (with smile detection, panorama capability, and in-camera image editing), an integrated GPS and FM receiver, 2 GB of flash storage plus microSD removable storage. 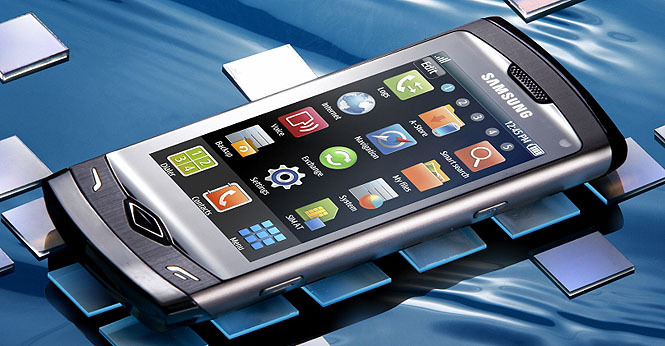 Samsung hasn’t announced pricing information for the Wave, but promises it will be available globally in April 2010. Initial specs have the Wave riding HSDPA 900/2100 (850 in Australia() and quad-band EDGE/GPRS.